Tiger Balm Arthritis Rub contains a blend of Camphor and Menthol as an active ingredient profile. Warnings: For external use only. If swallowed, get medical help or contact a Poison Control Center immediately. When using this product: use only as directed; avoid contact with eyes and mucous membranes; do not apply to wounds, damaged or irritated skin; do not bandage or cover with wrap or use heating pad; do not use 1 hours prior to bathing or 30 minutes after bathing. Stop use and ask a doctor if: condition worsens; severe skin irritation occurs; pain persists for more than 7 days; pain clears up and then recurs a few days later. Pregnancy/breast-feeding warning: If pregnant or breast-feeding, or if you have sensitive skin, ask a healthcare professional before use. Keep out of reach of children. Active Ingredients: Camphor (11%) and Menthol (11%). Inactive Ingredients: Cajuput Oil, Chondroitin Sulfate, Cinnamon Oil, Clove Oil, Deionized Water, Dementholised Mint Oil, Diazolidinyl Urea, Glucosamine Sulfate, Methyl Paraben, Methylsulfonylmethane (MSM), PEG-120 Methyl Glucose Dioleate, Propyl Paraben and Propylene Glycol. Recommended Use: Shake well before using. Apply generously to affected areas and massage gently until cream is absorbed into the skin. Opening: Shake well before using. To release, turn the pump counter-clockwise. Pump until cream dispenses easily. 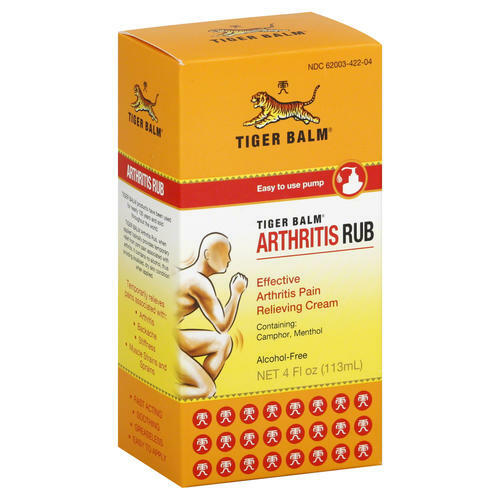 For adults and children over 12, rub well on the affected area. Repeat 3-4 times daily. For children 12 years of age or younger, consult a doctor before use.